Over the years, especially in the early years of the loan, Giants officials pointed to the debt service as a reason the payroll wasn’t as high as it might have been. That wasn’t necessarily the case in recent years, as both revenues and payroll soared. There is good reason for that not to be the case, and it has to do with sunk costs. When sports team owners consider spending money on a new player contract, they should rationally be thinking of it in terms of whether it will generate a positive return on investment: If I spend $100 million on a new outfielder, is it likely to mean enough new ticket sales, bonuses for playoff appearances, etc., that I’ll come out ahead in the end? On that basis, having an extra $18 million a year stadium mortgage payment — or a bunch of extra debt because you got snookered by a con man — shouldn’t make any difference, since a worthwhile contract is still a worthwhile contract regardless. Now, there’s plenty of evidence that team owners don’t think rationally about this much of the time — that they instead look in their pockets, see how money is there, and then think, “Time to go shopping!” But it’s also possible that some team owners, like the Giants’, can on occasion get beyond the sunk cost fallacy, which would explain why having to make stadium payments didn’t affect their payroll spending, and why being freed from them won’t affect it now. It’s something to remember the next time a team owner claims that they can’t pay towards their new building because then they wouldn’t have enough left over to field a team — if they truly think that way, it’s because they’re dumb, and if they don’t truly think that way, they’re hoping taxpayers are dumb. Too bad about the bonfire, though, as that would have been a fun way to celebrate the completion of possibly the fairest all-around stadium deal in recent sports history. Instead Baer had to celebrate with some kind of creepy fist-pumping white guy dance, which just isn’t the same. This entry was posted in San Francisco Giants by Neil deMause. Bookmark the permalink. I’m a South Bay A’s fan who despises the Giants’ South Bay territorial argument. 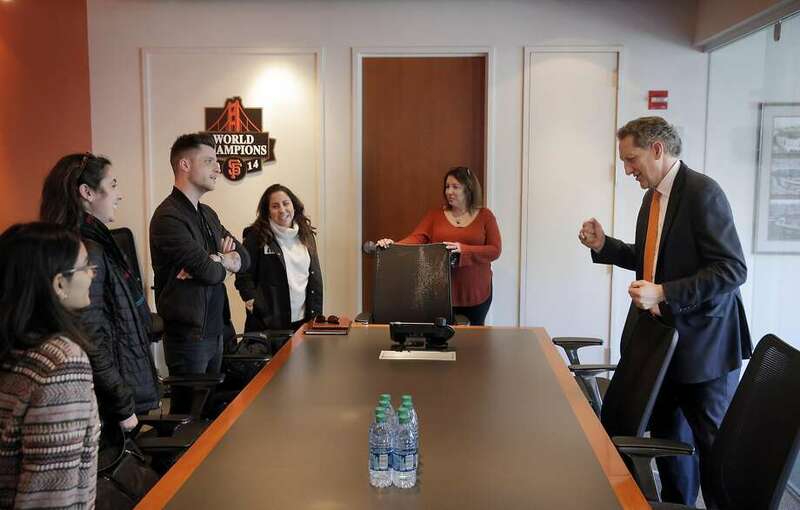 That said, I acknowledge that the AT&T Park undertaking, from concept to final mortgage retirement, as the gold standard in how to build a stadium that equally benefits the fans, community and taxpayers. Really amazing. You can continue to hate the Giants. Whatever they spent in mortgage payments they’ve more than made up at the different minor league farm clubs and spring training taxpayer subsidized parks. As a Giants fan living in Sacramento, I’m as happy as one can be. This was the gold-standard, and now I think my beloved Warriors are about to complete 1B of that form — if you catch my drift. I will point out that when you win 3 rings in 5 years, that helps. A lot. All teams need to win 3 in 5. Who cares if that’s not mathematically possible? Good points, Mark and Mike. And Barry Bonds and his home run record chase helped as well early on. Remember, the Giants have an ancillary development project located next to the ballpark. They will have quite a few future long term revenue streams coming into their organization. Ditto for the Warriors new arena project. I wonder how stupid Santa Clara feels? Few players in any sport result in direct ticket sales , this might be especially true for baseball at the moment where their best player is unrecognized by 99% of the USA population. Wins have a huge impact on ticket sales, however. Since the Giants claim every game is a sell-out, players and wins don’t seem to make a bit of difference. Note: the Giants’ claim is BS and this is posted sarcastically.